For God is sheer beauty, all-generous in love, loyal always and ever. Loyalty is challenged every day and in every way. Promises and contracts are broken over next to nothing. Marriages that were supposed to last till death disintegrate in double quick time. Even building church can be a fragile business. Not only do we see church members jump churches but leadership teams, once strong can self destruct in a matter of moments. Loyalty is not found in words but discovered in days of joy & disgrace, long nights of hardship and years of struggle & plenty. 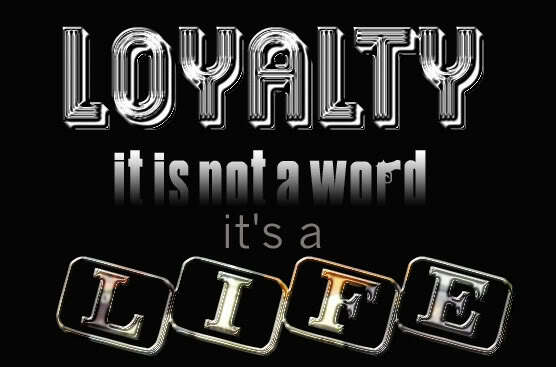 Jeffrey Gitmore said, You don't earn loyalty in a day. You earn loyalty day-by-day. But the great thing is that we do not have to earn God's loyalty. We have it "always and forever". He doesn't walk away in disappointment, turn his back in shame or lash out in anger. He remains forever your loyal friend.